The Gay Gamer: I think Burp'n'Shoot would have been a big hit in the U.S. 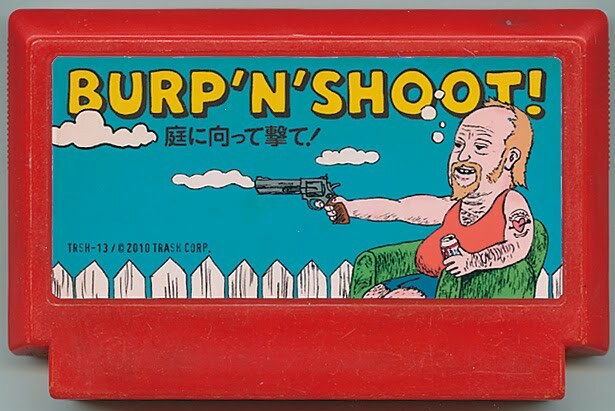 I think Burp'n'Shoot would have been a big hit in the U.S. This is one of those days I look forward to all year: The day the latest "My Famicase Exhibition" creations are displayed on the Interwebs (courtesy of the folks at Meteor, a Tokyo-based "game culture shop"). Never heard of the Famicase exhibition? No worries. Basically, it's a collection of imaginary Famicom cartridge covers created by Japanese artists and designers. One of my favorites is Burp'n'Shoot, which Boing Boing's Brandon Boyer says is a "fun lazy redneck experience" that involves "sitting on the backyard couch, drinking Budweiser and shooting at empty cans, watermelons and a broken TV" while avoiding the errant basket- and baseballs of the neighbor kids. Unfortunately, unlike Boyer and the chaps at tinycartridge.com, I don't understand a lick of Japanese, so you'll have to go here or here to read translated descriptions of some of the exhibition's other entries. Do kiwis dream in color?